I would like to to a segment on my blog about parenting boys. If you are a parent to boys, I would love to have you do a guest post on my blog! If you have your own blog, you can of course link back to your blog on the post, if you don't have a blog....that is great too! What should you write about? 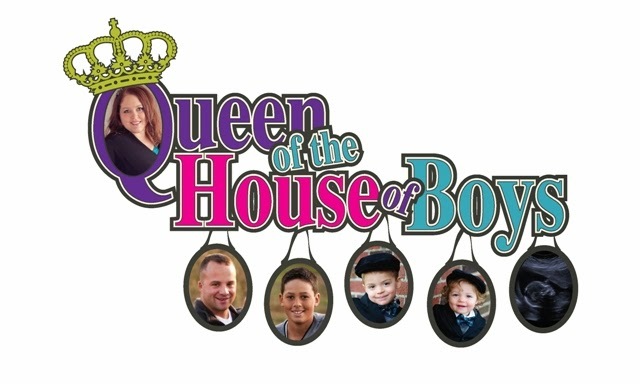 If you have boys only, and are a mom, what is it like for you being the "Queen" of your house of boys? Do you have some funny stories to tell about being a mom to boys? Do you have girl time you set aside for yourself so you don't lose yourself into a sea of baseballs, frogs, rocks, and all things blue? Do your boys listen to you or your husband more? Personally, I will admit...that when my first son, who is now 11, was born, I didn't know what I was having. I really did want to have a girl. I can say that I was actually a bit sad when they said, "It's a boy! "...but all that soon melted away. Oh, and with our second son, who is now 17 months old...when on the ultrasound they said..."It's a boy! "...I was a little dissappointed. But that very quickly faded once I heard and saw the expression on Xavier's face when he found out! He was so excited, and I was excited that he was getting a little brother. Of course, I would be lieing if I said I still didn't reserve a part of my heart for hoping for a daughter some day, but I can honestly say that if our next...if we have a next...is another boy, I would be content with another boy. PS. I should make sure to mention, I don't blog for money...I'm not that fancy...yet...maybe never, but we'll see. ;o) So what I get from this? Enjoyment....pure, simple enjoyment of uniting with other parents. Sorry no help here Janelle! But I do have your Pampered Chef stuff! Will you be in Des Moines anytime soon? Otherwise I think we'll be going through Newton next sunday [not this one] and could drop it off? Sorry I just keep forgetting to tell you! Oh my goodness! I completely forgot that you sent me that message. No plans to be in Des Moines anytime soon, I will get it in the mail to you today...and then if you still want to drop it by when you come through, you are welcome to do so. Thanks so much for ordering for me. I can't wait to get together with the family at the shower! I don't have a blog, but enjoy reading others. I have 3 boys, ages 8, almost 6 (on the 26th), and 2. I'm going to start following your blog and am looking forward to reading what other people have to say about raising boys. I agree with your comment about not having all the "girl drama" since we have boys! They definitely have their own challenges though! Great idea! I only have 1 boy after having 3 girls. Man boys sure are different! I look forward to reading all the info about boys as they get older as mine is only 23 months. Hi--I think I 'qualify' to post--lol. I have 4 boys. We are expecting a (surprise) #5, which happens to be a GIRL next month! I didn't think my hubby had any X sperm! lol. Their ages are 11,9,7 and 4. They are loud, wild and crazy! I'm so glad they all have each other. I have friends who only have 1 boy and that child is jealous of my boys because they have so many brothers. Somedays I feel like I might lose my mind--then the next moment, I'm so thankful for them. I'm not real sure how guest posting works, but I thought I'd answer the questions for fun :) I have a son and a daughter. I think I am the exact opposite of most women, because I always hoped for a baby boy! I got a girl first, and let me tell you, you've never seen a little girl dressed in so much blue clothing! That changed once I had my baby boy (two years later). I was SO excited to buy toy cars and trucks and all sorts of little boy stuff. •Do you have some funny stories to tell about being a mom to boys? •Do you have girl time you set aside for yourself so you don't lose yourself into a sea of baseballs, frogs, rocks, and all things blue? My little guy dresses up in his sister's tutus and fairy wings, so I don't necessarily have this problem. •Do your boys listen to you or your husband more? I'd say it's fairly balanced. He doesn't listen to either of us. You know, that 4 year-old selective hearing issue? He's great at that! But we love him to pieces. I said hello on blog frog - but I'll say hi here too!! I would LOVE to do a guest post with you!! I love collaborating with other bloggers and I LOVE this idea!! I can't wait for this! I am the single mom of a 7 year old son and I am dating a man who also has a 7 year old son. Not a day goes by without me hearing the words ... "It's a boy thing". If you are looking for a guest blogger I would love to be included. This is a fantastic idea! I have 2 girls and 1 boy Hopeful will we have another son soon (trying to adopt) As for my son I really think he was the easier of my children he was a happy baby and a happy teenager the girls are bossy to the point of having to remind them I am the Mom. But on the plus side he will always have an extra mom in his sister's and they will have someone to always look out for them.